SpaceX fan Ben Pearson has created the website that makes use of NASA's Jet Propulsion Laboratory Horizons data to track the progress of the Tesla Roadster. An electrical engineer working in the aerospace industry has created a website to track Tesla CEO Elon Musk's Roadster — the car tied to Falcon Heavy rocket by SpaceX — which is zooming through space. SpaceX fan Ben Pearson has created Where is Roadster website that makes use of NASA's Jet Propulsion Laboratory Horizons data to track the progress of the car and its dummy driver 'Starman' through space, TechCrunch reported on Sunday. The website would also predict the car's path and let people know when it would come close to meeting up with various planets and the Sun. The platform would even tell the Roadster's current position as well as its speed and whether it was moving towards or away from Earth and Mars at any given moment. 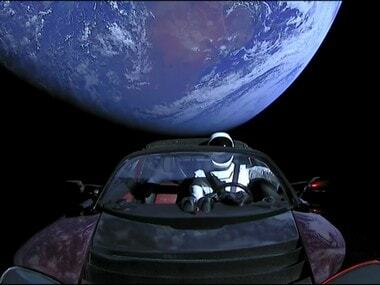 "I'm sure it's parked around here somewhere …http://whereisroadster.com," Musk, the SpaceX CEO, tweeted late on Sunday. The car was originally intended to be inserted into an orbit that would fly closer to Mars but the third engine burn of the Falcon Heavy upper stage "exceeded" that orbit, sending the car into deep space. "Meanwhile, Mars is moving too, so when the Roadster first intersects its orbit this July, the planet itself will already be millions of miles away," the report said. After that, the Roadster will actually return to something close to Earth's orbit, though again, Earth itself won't be anywhere close. According to the site's data, the Roadster won't actually be close to Mars until early October of 2020. The car does not have any landing equipment or thrusters to land it on the surface. Gianluca Masi of the Virtual Telescope Project and Michael Schwartz of the Tenagra Observatory were able to pinpoint the car's location by using data generated by the Solar Systems Dynamics Laboratory at NASA's Jet Propulsion Laboratory. The project said that the Tesla was "quite bright".